The Matson family prides itself on doing quality work in the community where it has resided for 6 generations. We are a full service company doing residential, commercial and industrial jobs, as well as procuring permits and offering consultation through each phase of your construction. If you drive around the City of Fort Bragg, chances are you are passing by numerous sites we have worked on, such as the Old Coast Hotel and the Fort Bragg Credit Union . 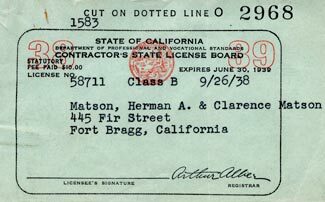 Herman Matson immigrated to the United States in 1906 from Sweden, and, after a short stay on the East Coast, moved to the San Francisco Bay area in the early 1900’s, where he found plenty of work after the great earthquake. From there he eventually migrated up the coast to Mendocino County, where he secured employment for the Union Lumber Company as a carpenter. He would cross town every day carrying his tool box on his shoulders for work. Herman went into the building trade for himself in the late 1920’s. Herman's son, Harold, left to serve his country in the South Pacific with the US Navy’s construction batallion, the Seabees, during WWII. Upon return, Harold joined the business and the two went on to do numerous projects until Herman's retirement in the 1950’s. Harold forged on ahead with his wife Joanne until they were joined by their next son, Jerry, in the early 1970’s. After many more years and successfully completed projects, Harold passed away in 1991. Jerry, along with his mother Joanne, wife Jackie, and son Chris, carry on to this day the tradition and trade that their beloved grandfather Herman started all so many years ago. 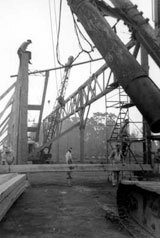 They are still known today as Matson Building Materials and Matson Construction, Inc., working hard to maintain the quality and trust carried in that name, and the legacy for the next generation to take over.